2 Method №2 - perhaps can not work!!! In our time, the Internet has become the main occupation during the holidays. A particularly large number of people are stuck in the popular social networks: In contact with, Classmates, My world, etc.. Closer look at "Classmates". The social network has a large number of opportunities: video preview, listening to music, communication between people, also exchange events. But sometimes it happens, that the information strip, where you can see all of his friends almost all, very much starts to bother. Or, that in most cases there is, This voracious users, specifically sending spam. As a result, there is a desire to turn off the tape in Odnoklassniki. If you want to "turn off the tape" for some people, that you do not communicate, simply delete them from friends and more of their actions will not fill your information tape. but, In this method, there is a minus, because for these people may be your friends or family, which may have undergone cracking pages. Method №2 - perhaps can not work!!! On their page went down site, there you will see "Online". 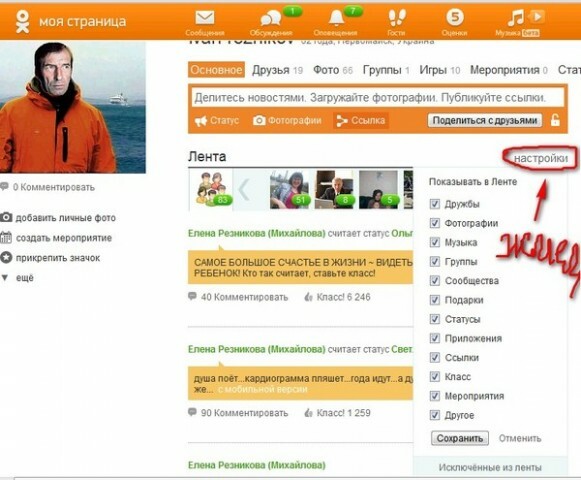 after clicking, select the tab "Lenta". Next is the setting tape, which can be turned off as well as individual items, and all the items. After disabling these items your tape is completely empty. This method is needed in order, to lock itself to a particular user, who bored you with my, eg, services, suggestions, requests. What should be done, To do this in your belt is his record. Top right cross each record is present, means the removal of the recording and the mark "Spam" "insatiable" user, press agree, it is spam. After that, all subsequent and previous entries in the tape disappear spammer. This method assumes a control on / off ribbon via the address lines, what changes need to enter later revealed. If after disabling the ribbon, you will want to re-enable it, then go to the address bar, in which at the end of the reference is the word OFF. Again displayed our window, only this time asking for the inclusion of the tape, We agree and tape back to work. It's all about friends, What if there was a desire to exclude from the tape are not desired groups? For this it is necessary to go to the desired groups. Next head to her avatar, and below we press the tab "Delete from the tape". All the groups do not appear in your stream.